Hi guys, looks like I've got a leak where the spigot goes through the bottle cap on the Alpine. Anyone got a fix for sealing it, same glass bottle as R12/15/16/17 etc. Or anyone got a spare? That is just standard low grade steel. You can solder it or for a more permanent solution silver solder it. 21571, bowie and Kenfuego like this. Soldering is easy. The spigot is steel, the cap looked like aluminium though. Didn't have a decent magnet handy though. Yeah, silver soldering is better, but soldering should be fine. Does need inspecting every so often because it will cycle close to the melting point of solder and might crack/"dry". A quick reflow with some flux should be enough to keep it happy though. Great! I wasn't sure about aluminium and solder, even of the silver kind. Now to dig through the shed bench drawers and find some. 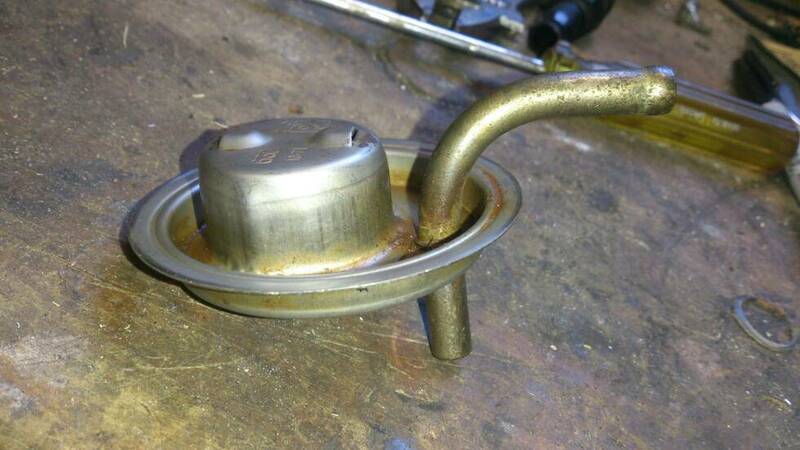 Given there is a rubber valve in the "top-hat" section of the cap, it may be worth using one of the wick-in Loctite products rather than solder. I've used one on a brass radiator header tank (running "normal" radiator pressures) in the past with success. Kim Luck, Sunroof, JohnW and 1 others like this. Yeah, I thought about that. Silver soldering might be a problem, tin soldering I don't think so. Just need to be quick with the heat so it doesn't soak. Take the thing apart, clean the surfaces where the tin goes, tin well both parts and then a quick heating at the join should do it. Maybe practice your technique on some scrap. Use a powerful iron so you put a lot of heat locally quickly. I've never done it but I remember seeing cars come into the yard that had been soldered and were working fine. Thanks guys, I'm off to Bunnings tomorrow to get some appropriate solder. Ray has put some caps in the mail for me too. What are the thoughts on a bit of plastibond smothered around the joint? I swear by epoxy metal for a lot of jobs like that. JB Weld is fairly runny and Devcon is stiff. JB would fill the crack but may need a small dam made from perhaps BlueTac until it dries. Perhaps 24 hours. Devcon works for fuel tank leaks so should be OK but would need to be pressed into place. From memory both handle high temperature. I have used them for major rebuilds of old castings, fuel leaks, and worn axle shafts with long term sucess. I have soft soldered the pipe into the main body, it being stainless steel. I was a little worried about the amount of heat for silver soldering affecting the valve. Used an LP gas type flame as heat source, as the body is a large heatsink and would be very difficult to do even with a big iron. So may JB Weld products, I'm guessing the steel stick, tank weld or the epoxy would be the go? Last edited by Reidar; 1st April 2019 at 08:34 PM.